Jump to a question on the page by using this menu. What's the Pricing on New Era Caps? When Will I Receive My Caps? Why ask for Snapback sizes? Can My Order Be Expedited Or Rushed? Can I Order Blank Hats? Send us your logo(s), if you need help with a logo or want us to look through New Era’s library let us know and we will be more than happy to help you out! If you are sending us your logo, please send it to us in a JPEG format. New Era has to approve ALL logos before an order can be created with Top It Off. This process typically takes about 1 business day. Any Logo SpecificationsOnce we receive this information we will create an invoice and send directly to your email! After we receive full payment for the caps we will send your order directly to New Era. Within 3-5 business days we will receive your first digital mockup highlighting your logo specifications and cap components. We will then send this onto you where you can make any changes you would like before giving approval to head into the next phase. After approving the artwork, New Era sends your artwork to the digitization department. The digitizing process typically takes around 5-7 business days. Once we receive the final roal card from New Era we will send it over your way for final approval. The roal card, as New Era calls it, is considered your hat’s DNA and will tell the factory exactly how to construct your hats-so please make sure to look over this very carefully. Once the roal card has been given your final approval your order will be sent into the production lineup. Your caps will then be given a ship date. Not sure about your ship date? No problem! Simply contact your Sales Representative and they will be more than happy to assist you. Choose “Shop” from the main menu. If you chose the custom builder, choose the various colors you would like on your cap. If you chose a stock cap, choose a single cap color. *All logos must be approved by New Era before Top It Off can create an order. Once inquirers are submitted, a staff member will contact you. 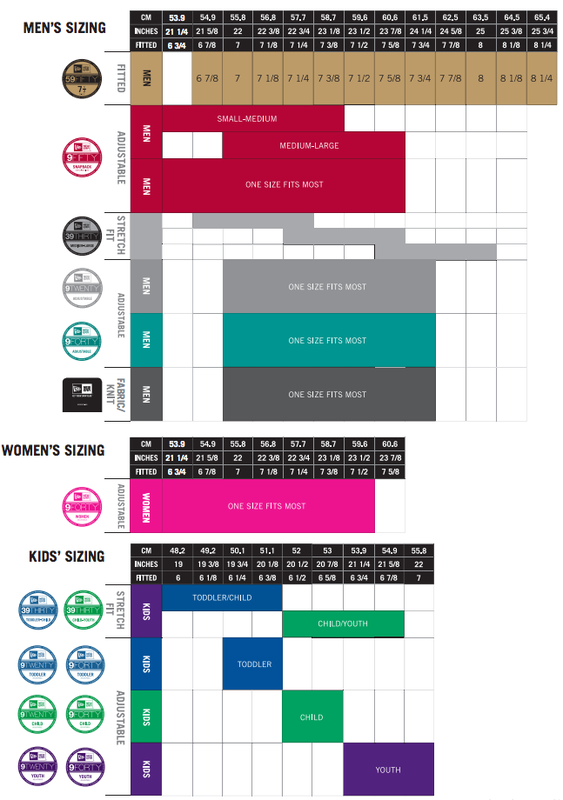 The first pricing chart below shows basic pricing for hats which includes front embroidery. Adding a back or side logo will increase the pricing of the hats by $2.00 per cap per location. All New Era hats include the iconic New Era flag on the left side of the cap which cannot be removed. Shipping costs will be determined by the number of hats ordered and the address (typically between $25-$50 per order). New Era offers complete customability for the 59FIFTY and 9FIFTY Snapback with the recent addition of the 39THIRTY diamond fabric. These caps are completely customizable and give you the opportunity to tailor the front, mid, and back panels, button, eyelets, visor, and undervisor. Have a specific vision of your team’s dream cap? Custom caps would be your perfect addition! New Era offers a line of caps that are ready for your logo to be stitched on including the 59FIFTY, 39THIRTY, and 39THIRTY NEO, among others. These caps are only offered in certain colors which can be seen in our cap builder function. Stock caps tend to ship out faster in comparison to custom caps dependent upon the time of year. Not too particular about various colors and need your caps fast? Stock caps would be the route for you! Custom 59FIFTY, 9FIFTY Snapback and 39THIRTY orders typically take about 30 business days (2 ½ to 3 months) from the time you sign off on the official artwork from New Era. Stock caps typically take about 15-20 business days (3-4 weeks) from the time you sign off on the official artwork from New Era. Yes, you can use your team’s logo! However, New Era has the final say in whether or not they will approve the logo for the caps. Due to New Era’s close relationships with various professional sports and college programs they strongly protect themselves against any infringement allegations. You can upload your logo into our custom hat building application. If you do not have a digital file of your logo you can take a picture of the logo with a camera and email it to info@topitoffhatco.com. Have a generic logo you would like to use, such as a block letter? Just let us know and we can search New Era’s vast library of artwork! Although the 9FIFTY Snapback is adjustable it still comes in two different sizes to better suit your team needs! Due to the custom nature of each New Era cap, orders cannot be expedited or rushed. Please plan accordingly to allow enough time for your order to be delivered. Contact a sales representative in order to find out current lead times as they do change throughout the year. New Era does NOT sell blank hats. In order to maintain brand integrity New Era embroiders all logos and insignias on their caps.